Rabbit pelts have been used for many years as fur, in the manufacture of felt, and for a variety of miscellaneous toys and other items. With the development of many synthetic fibers and imitation furs, the demand for pelts by furriers has decreased. Today there are few if any market for furs in the United States and is considered a waste product in many a commercial slaughter house. Rabbit pelts vary widely in quality and value. The different types of fur characteristics vary depending on the breed type, such as the Rex, Satins, Silver Foxes and other fur type breeds(also know as dual purpose rabbits- meat and fur) Pelts from the young of any breed are normally of poor quality and of less value than those from adult animals. The young fryers pelts are thin and can tear, but are still usable but the older rabbits make a stronger finished product. Those with dense winter coat that is not easily removed from the pelt, are most the most sought after. Hang the pelts in a well-ventilated drying area, but not in direct sunlight. After the skins are dry the wire shaper is removed. Do not use salt or other chemicals on skins, but as they are being packed for storage or shipment, naphthalene (moth crystals) or paradichloro-benzene may be placed in the packaging container as an insect repellent. There are so many ways to tan fur, here is just one of many. Freeze the hides until you have enough to tan (I usally wait till I get 6 or more). I keep them turned inside out. This process is a salt / acid process. This works very well and makes some nice pelts for coats, hats, and my favorite blankets. Wear safety glass and rubber gloves when using this acid mix it is very dilute but will still irritate your eyes. 1. After dressing the rabbit, toss the raw hide (split down the belly, not cased) into a Ziploc bag and put it into the freezer. Do not salt or dry out, you don’t even have to flesh them either. When you have 6 or more, you’ll have enough to make it worth your while to tan. 2. Thaw out the frozen hides, run under warm water to remove ice. 3. Rinse well and squeeze out excess water – DO NOT WRING THEM!!! SQUEEZE ONLY!! A SCRUBBED BRICK OR ROCK to hold the pelts from rising to the surface of the solution. There are many other pickle solutions. I have use this method and am happy with it! 5. Run 1 gallon of HOT water into the bucket, add salt and stir to dissolve. Add 1 gallon of cool water (not cold). Water temp. should be about 70 degrees. 6. Slowly add acid by tipping the bucket toward you and allowing the acid to dribble down the inside into the water. Be careful not to splash liquid and stir carefully with a non-metallic spoon or stick till blended. You may want to wear rubber gloves for this. ALWAYS WEAR EYEPROTECTION! Remember the old saying when using acid and water “Water to acid prepare to be blasted” ALWAYS add the acid to water slowly not the other way around!! 7. Lower the completely thawed hides one at a time into the bucket. Submerge in liquid with the stick and slide brick or rock down the bucket upright and allow the rock or brick to settle on top to the hides. At this stage the acid is not strong enough to do any real damage to your skin but you don not want to splash it into your eyes! 8. Put a piece of plywood on top of the bucket and stash away in the garage or closet where no one will disturb it or get into it. Make sure that wherever you put it, it will stay at approx. 70 degrees. Too hot and the hides will be damaged, too cold and the tanning process will be delayed. 9. Leave the bucket alone for 1 week. Put your rubber gloves on then gently remove hides from the acid solution with the stick. Allow them to drip over the bucket then SQUEEZE to remove excess liquid. Do not take to the sink. Run under cool water and add dish detergent to remove the remaining acid mixture. Rinse and squeeze out. 10. At this point the flesh on the underside of the hide should be thickened and somewhat separated from the hide. Grasp a piece on the edge and you should be able to simply peel the flesh off, often all in one piece. Be very careful with junior hides, as they tend to be very thin and easy to tear. If the flesh is very tight on the hide, it isn’t “prime” yet and should be returned to the acid solution for a few more days. 11. After fleshing, return the hides to the acid solution and leave for another week (can be safely left for up to a year). 12. When you pull out the hides after at least a week, remove the pelts and swish them around in soapy water. Squeeze as much water out as possible. Now lay pelts over the porch railing, back step, or make a drying rack to allow the pelts to drip dry. At the first sign of drying (white patches on the flesh side), work the hides gently over the back of a chair, 2X4, fence post, rough rope ect. pulling the pelt back and forth and then pull gently till the flesh side turns white all over. Pelts can be thrown in a very cool clothes dryer and tumbled for a while to help the drying/softening process. 13. Once the hides are worked till soft and completely dry this takes LOTS OF ELBOW GREASE! If you have allowed the pelts to dry stiff without working them, toss them in a pan of water to soften and then start over with the drying/working process. It doesn’t take more than a few minutes each to work the hides to a nice suede like softness. 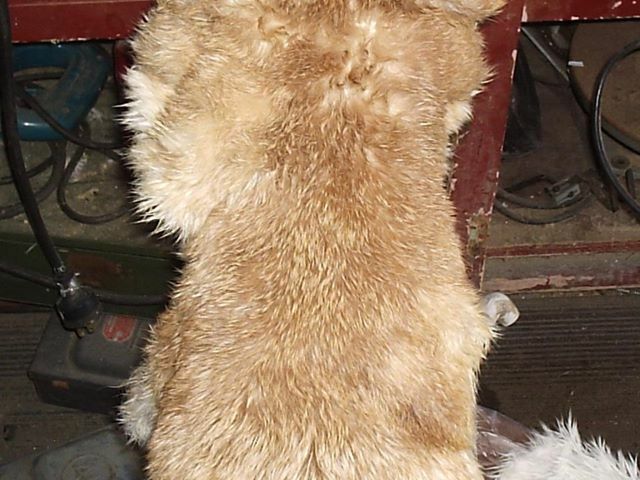 Rub the fur side over the back of a chair also to make the fur soft and natural looking. After you are done with the tanning solution, add a couple cups of baking soda to neutralize the acid. This makes it completely safe to dispose of. Good luck!!! Let me know how you do! I am currently writing up a post on NATURALLY TANNING RABBIT PELTS so stayed tuned. 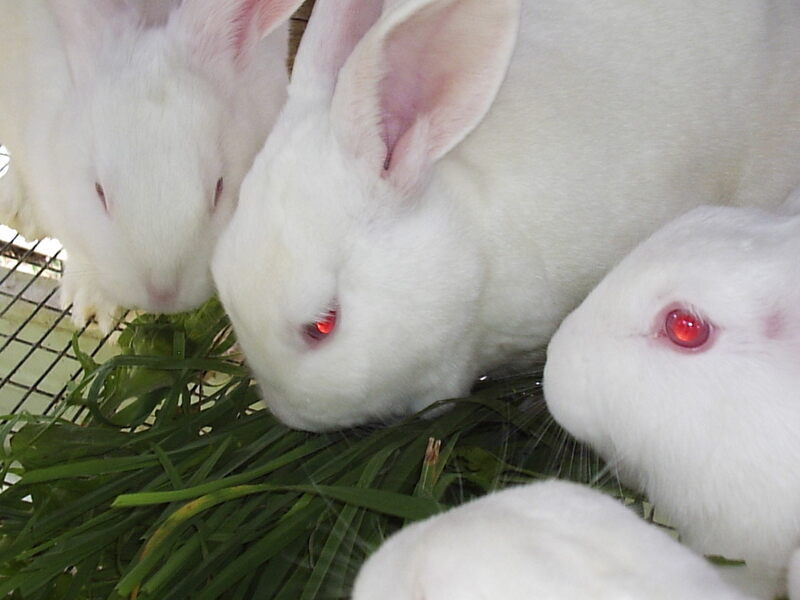 JOIN THE RABBIT REVOLOUTION! Like us on Facebook and subscribe to our blog to get all the newest post as they are posted!